So my grandfather was visiting us here in Dubai for about two weeks and as is my tradition whenever he visits, I throw a small, intimate dinner party for him. Just for us and our closest family/friends. This time I had the dinner party the night before he left as I had just finished exams the day before that! As I had been so busy with exams, I didn't have a chance to "pre-plan" the theme of the night. What the flowers would be like, what the table setting would be like, and what ambience I would create. What I ended up doing the morning of the dinner was stand in front of the dinner table and visualize the crockery and cutlery we have and see how I can mix and match. What I ended up doing was more creative than any other table setting I have previously done. I decided to label the theme "outdoor bazaar" after I was done with it. Everything was mismatched. 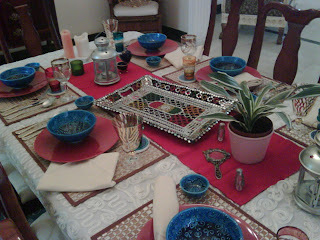 I used plain red dinner plates from IKEA and placed traditional turquoise ceramic bowls from Turkey as soup bowls. I then folded each cloth napkin in a different way. I also added turquoise coasters from Turkey and placed Moroccan tea glasses on them- these were the drinking glasses for juice. For water, I picked up a variety of different gold glasses and arranged them at each place setting. The placemat was thatched and bronze and the table cloth was ivory net with gold trimmings. I placed a red table runner through the middle and made the centerpiece a beautiful glass mosaic tray from Pakistan. I also placed outdoor IKEA lanterns on the table and arranged potted plants around the plates. I found various knick knacks around the house, like old vintage perfume bottles and a waistcoat pocket and added them to create the ambience of antiques in a bazaar. The smell was represented by the variety in the food and the sound of the bazaar was more than reminiscent by the chatter on the table and the sounds of cutlery hitting crockery. So here's the menu: my grandfather asked me to keep it simple so I tried to find some quick recipes to make. Fresh tomato and red onion salsa with Doritos! Chocolate self saucing pudding- served with Vanilla Icecream! The dessert is best served EXTREMELY hot! And what I ended up doing with the fritattas was place them in a normal sized muffin tray. If you make them in mini tins you end up with 48. We didn't need that many as we were very few at dinner so I ended up making one batch of minis (so 12) and two batches of normal sized ones (so 24). The minis make for adorable hors d'oeuvres at parties as they are extremely bite-sized and delicious! Plus, they're very easy to make! Unfortunately I do not have proper pictures of the food as I was rushing around to serve it and plate it and all that. But I DO have a picture of the table when it was halfway done.